In some cases, you may need to transfer various files from one Android phone to another Android phone. For example, when you find some interesting photos or entertaining videos, you may want to share it with your friends or families; when you buy a new Android phone to replace your old one, you may need to transfer everything from one Android phone to another, including contacts, messages, photos, apps and many more. So how do you always start the process of Android to Android file transfer? By bluetooth? By Email? Below is the free trial versions of this software! Want to give it a try by yourself? Just download the right version to try it out! This software won't let you down! (1) After opening the installed software on the computer, get the two Android phones connected to the computer via two USB cords. Then you will see the below interface. (2) Then you will then see an interface where different file folders are arranged on the middle panel. Click "Flip" button to change the side between Destination device and Source device if needed. (3) After that, tick out the files you want to transfer from one Android phone to another Android phone, such as "Contacts" and "Photos" and more. Finally, hit on the "Start Copy" button to begin the Android to Android file transfer. Within a little while, the whole file transfer process will be finished! 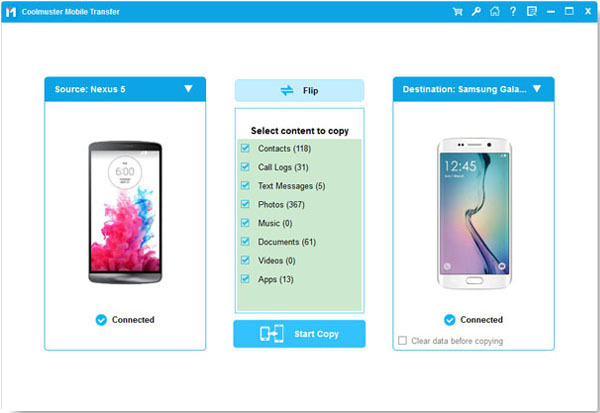 With this Phone Transfer software, sharing files between two Android phones is just a piece of cake! So why not give it a try if you are looking for a way to transfer files from Android to Android? Another Android data manager tool named Android Manager lets you transfer data from Android to Android with simple steps. 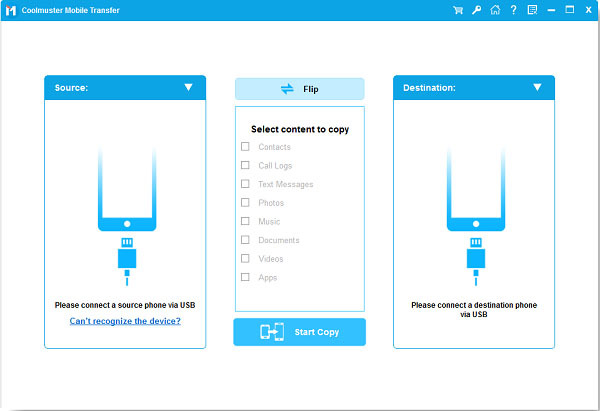 This software makes it possible to transfer all of the files from your old Android to computer, and then restore to your new Android device with zero data loss. It works on both Windows and Mac OS. Step 1. Run the Android Manager on your computer when installation finished. Connect your old Android phone to the computer through USB data cable. The program will detect the phone and display it in the primary window. Step 2. Click the Super Toolkit option from the top menu and click the tab of "Backup". Select the file types you want to backup from the old Android and click the "Back Up" button to save them on your computer. Step 3. Disconnect the old Android after the transfer is finished. Then, connect your new Android phone to the program via a USB. Go to Super Toolkit and click "Restore" button. Then, select the backup record you have done in step 2, and restore it to the new Android.